The satellite image above was taken from space. It shows a region of Siberia where wildfires are consuming massive areas of tundra and woodlands. 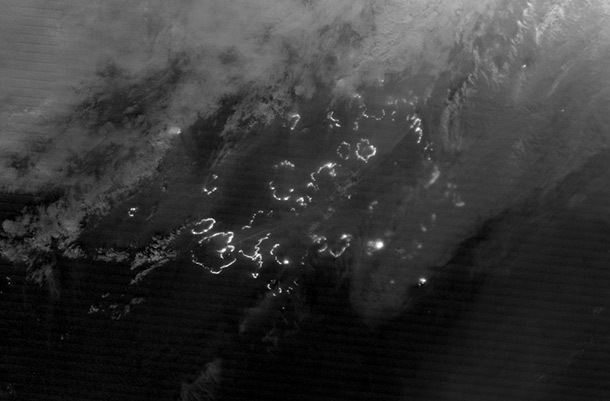 The ring-like structures you see are fires, their night-time glow visible to infrared cameras in space. Not only has this summer shown unprecedented heat, drought, Greenland melt, and sea ice melt, we have also seen massive and expanding zones of wildfires across the northern hemisphere. In the US alone, 10,000 square miles has burned so far, making this one of the worst years in a decade of extreme fire years. In California, more than 8,000 firefighters were engaged in containing wildfires. In Idaho, Oregon, Washington, Montana, Wyoming, and Arizona, thousands more battled blazes as whole towns were evacuated. In Russia, an army of nearly 200,000 firemen, nearly double the number of US soldiers deployed to Iraq and Afghanistan combined, and 40,000 vehicles struggled to get immense blazes under control. The level of activity on the ground is nearly equal to that of a war. And all just to fight this summer’s bought of climate-change enhanced wildfires. In total, preliminary reports show that 12 million acres had burned in Russia by early August with fires showing potential to reach or exceed the vast areas burned in 2010 by season’s end. Across Spain, more than a dozen wildfires raged, forcing thousands of people to evacuate and killing 2 more there. The Canary Islands La Gomera forest, which has survived for 11 million years, was under threat of being consumed by a massive blaze that has already claimed ten percent of its woodlands. Spain has been suffering from fires since June when a massive blaze rained ash over the city of Valencia. Unfortunately, these fires are spurred on by intense summer heat and extreme weather events influenced by climate change. And as we have seen over the past decade, as the globe has warmed, the frequency and severity of these blazes has increased.